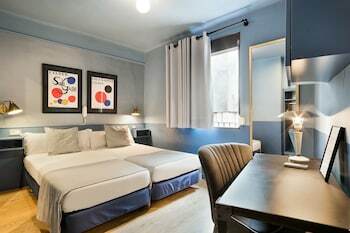 With a stay at Hotel El Call, you'll be centrally located in Barcelona, within a 5-minute walk of Las Ramblas and Gran Teatre del Liceu. Featured amenities include a 24-hour front desk, luggage storage, and an elevator (lift). Located in Sa Pobla, this villa is within a 10-minute drive of Museu de Sa Jugueta Antiga and Muro Ethnological Museum. Free self parking is available onsite. When you stay at Apartamentos La Fuente de Enmedio in Suances, you'll be near the beach and 13 minutes by car from Ensenada de Ballota. Free self parking is available onsite. With a stay at this vacation home in Cambados, you'll be within a 10-minute walk of Church of Santa Marina Dozo and Mirador De A Pastora. Free self parking is available onsite.